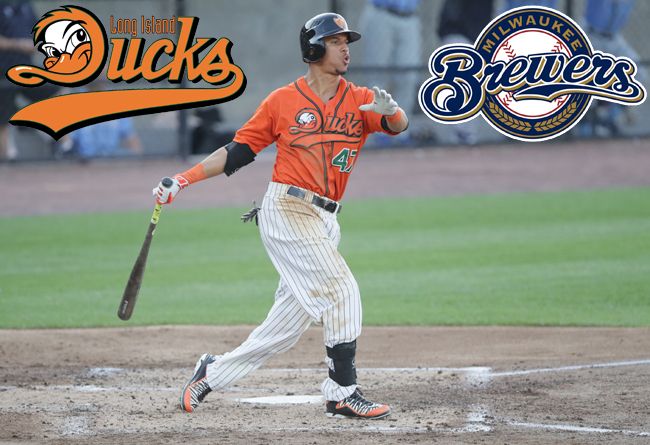 (Central Islip, N.Y., Sept. 5, 2017) – The Milwaukee Brewers today called up former Long Island Ducks outfielder Quintin Berry to the Major Leagues. He returns to the game’s highest level for the first time since October of 2015, when he was a member of the Chicago Cubs. Berry played 27 games with Long Island and compiled 23 hits, nine RBI, 16 runs, six doubles, one triple and 12 walks. He also showcased tremendous speed on the basepaths, stealing 15 bases while being caught just three times. The 32-year-old also did not commit a single error in the outfield. The Brewers purchased Berry’s contract on August 17 and assigned him to Triple-A Colorado Springs in the Pacific Coast League. With the Sky Sox, he played in 10 games and batted .286 with two home runs, three RBI, nine runs, one double and two stolen bases. Berry homered in his first game with Colorado Springs on August 20 against Oklahoma City and his most recent game on September 4 against Memphis. He reached base safely in eight of the 10 games he played, earning at least one hit in six of them and multiple hits in four. The San Diego native has four seasons of Major League experience, including one each with the Detroit Tigers (2012), Boston Red Sox (2013), Baltimore Orioles (2014) and Chicago Cubs (2015). He has played 125 MLB games, compiling a .265 batting average with three home runs, 33 RBI, 53 runs, 10 doubles, six triples and 27 stolen bases. He also appeared in back-to-back World Series with the Tigers in 2012 and Red Sox in 2013, winning the title during the latter.